Whenever we are lucky enough to be invited to provide one of our free on-site consultations with lovely people just like you, who are looking to downsize to an annexe in the back garden or have Mum, Dad (or both) coming to live with you at the bottom of the garden, we end up talking about all the “man” things first, like how the annexe is built, how long everything will take and how we go about applying for planning permission on your behalf etc. Well, if you have a list of practical questions like that, we though we’d inspire you a little with our best tips on how to approach downsizing to a Granny Annexe with confidence and in style. In fact a lot of Granny Annexe owners decide that now is the time to create a fresh start and start with everything new. If you are reading about Granny Annexes you probably already know you will more than likely be downsizing and moving to a smaller home. To discover how big Granny Annexes are compared to a bungalow check out an article we wrote about that by clicking here. Bear in mind that if you are moving from a 3 or 4 bedroom home to a 1 or 2 bedroom annexe, the chances are you probably don’t use the spare bedrooms upstairs very much nowadays anyway so perhaps you are already living in a similar sized living space to an annexe already and just hadn’t thought of it quite that way. So once the decision is made and you find a Granny Annexe floor plan you love, the next big decision is what furniture, favourite possessions, clothes & shoes and other items you’ve gathered over the years come with you? And also what style you want your annexe to have overall inside? Do you want a traditional style annexe full of all your treasured possessions and home comforts? Or do you want to yell “Geronimo!” and opt for something brand new throughout like the new apartment shown in the photo above? Once you’ve made that choice, the rest becomes easier because you’ll know what to shop for while we’re applying for planning permission. Especially if you arm yourself with some of our tips! When it comes to successful Granny Annexe interior design planning a trip to your nearest IKEA store is one of the best places to start. They have every solution imaginable and within their store you will be able to see open plan living spaces that are literally packed with great ideas for adding storage into every available space. 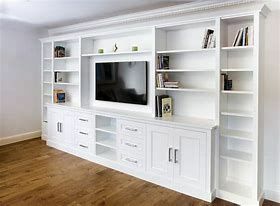 For example instead of simply putting the TV on a two drawer TV unit in the corner, think about putting the TV on the wall (space saver) or create a media wall like the one above with shelving and space around the TV for extra storage and for displaying those favourite family photos of yours. 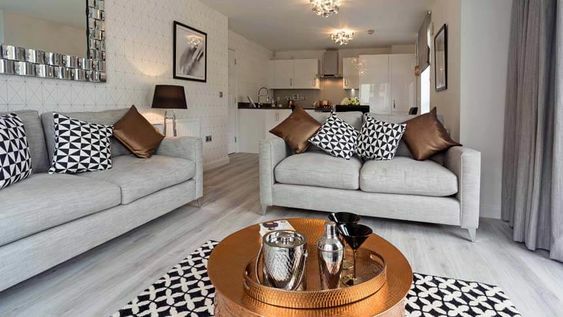 The more your furniture, soft furnishings and accessories match your overall colour theme the more coordinated and well thought out your annexe will look. That way by the time you move in you know exactly what you will be bringing with you and exactly what you will be donating to family members or a good cause. One of the easiest ways to triple or even quadruple the amount of storage space you have is to increase the number of drawers in any storage unit you have. If you think of a 3 drawer units in your bedroom versus a 6 or 8 drawer unit instead, you’ll get the idea quickly that by increasing the amount of storage space by going up doesn’t affect the floor space required. And one of the handiest items to have anywhere in your living area or hallway is an apothecary style drawer unit like the one above. No more boxes stacked up in a cupboard somewhere, just beautiful clean lines, stacks of extra storage and incredibly useful to have. Whether you choose a modern style Kitchen or a Traditional style kitchen from our Options Brochure, it’s what you do on the inside of the cupboards that matters the most when it comes to organizing your space. Today with Pinterest as our new best friend when it comes to ideas about organization, you’ll quickly fill up your Pinterest board with ingenius storage solutions for every kitchen cabinet you have. The key is to redefine the space within the (often wasted) cabinet space available by creating storage solutions that fill the space like in the example above. Instead of opening a cupboard and seeing it half full with all your tins and jars at the bottom, seek out shelving that allows you to stack rows of cans or tall perspex containers that you can fill up to the top with pantry items like rice, pasta and cereals. There are also some pretty nifty storage ideas for cupboards under the sink, pan drawers or larder units out there. You’ll never think of your kitchen by just number of cabinets ever again. The more you plan ahead, the more you will relax and enjoy the process! This is my favourite granny annexe interior design tip for new annex owners and for anyone making that move towards multi-generation living and being part of a family again. The number one motivating factor that makes Granny Annexe building so special to us is that we literally do change people’s lives one annexe at a time. Nothing gives us greater pleasure than making sure Mum, Dad (or both) get to enjoy being part of family life again. So why not gather up some of your favourite family photos and task a member of your family (who fancies themselves as a bit of a photographer) to create a special set of photos that can be turned into canvas wall art for your new annexe. If you play it super smart with colours (like in the picture shown above) and dress family members in the same colours as your decor you can enjoy the most unique and stunning addition to your annexe that not only looks beautiful but will give you a ton of smiles and memories every time you look at it.